Stephen Foster Handicap 2014 Odds: The Stephen Foster Handicap Presented by Abu Dhabi takes place Saturday, June 14, 2014 at Churchill Downs in Louisville, Kentucky and is part of the historic track’s “Downs After Dark” program. 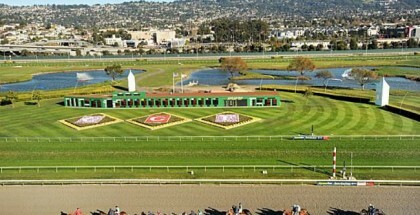 The $500,000 1 1/8 miles G1 dirt handicap is a Breeders’ Cup Challenge “Win and You’re In” race awarding the winner with an automatic starting position in the prestigious 2014 Breeders’ Cup Classic on Saturday, November 1, 2014 at Santa Anita Park. Revolutionary, with 2-1 morning line odds, will break from post position #1 with jockey Mike Smith in the 33rd Running of the Stephen Foster Handicap at Churchill Downs on Saturday, June 14, 2014. 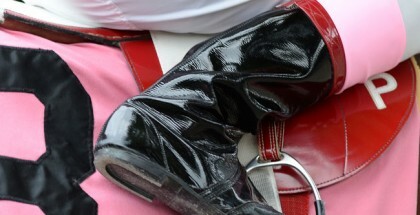 The 2014 Stephen Foster Handicap, named after Stephen Foster, the composer of the Kentucky Derby’s theme song “My Old Kentucky Home”, will host nine strong contenders in the 33rd Running at Churchill Downs including a few famous four-year-olds such as Revolutionary, Mylute, Will Take Charge, Long River, and Departing. Five-year-old Golden Ticket takes on the Stephen Foster for trainer Ken McPeek. Six-year-olds Moonshine Millin and Prayer for Relief are also confident contenders in the race. Seven-year-old Jaguar Paw is the oldest contender in the 2014 Stephen Foster Handicap field. Four-year-old Departing with 9-2 morning line odds will break from post position #6 in the 2014 Stephen Foster Handicap. With seven wins out of ten lifetime career races, the last being an “allowance optional claiming” at Churchill Downs, the son of War Front has high hopes for his connections. Trainer Albert Stall, Jr. had Departing prep by breezing four-furlongs in 49.40 for the 2014 Stephen Foster Handicap on Monday, June 9th at Churchill Downs under jockey Robbie Albarado, who will team up with the gelding for the big race on Saturday. Fan-favorite Will Take Charge with 5-2 morning line odds will exit post position #4 for the 2014 Stephen Foster Handicap with jockey Gary Stevens for trainer D. Wayne Lukas. Will Take Charge has raced nineteen times throughout his life with seven first place wins. The 2nd place Breeders’ Cup Classic participant is expected to rally hard in the upcoming Stephen Foster Handicap as he faces a few of the horses that beat him in his last race, the Alysheba Stakes, where he finished in 6th place behind winner Moonshine Mullin, Golden Ticket, and Mylute. Will Take Charge was assigned to carry 123 pounds in the 2014 Stephen Foster Handicap, which is five more pounds than his rivals. 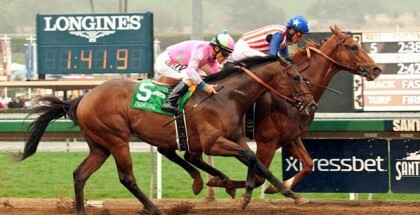 WinStar Farm’s Revolutionary will break from post position #1 with Mike Smith on the mount. Revolutionary comes in with 2-1 morning line odds for the 2014 Stephen Foster Handicap. Trained by Todd Pletcher, Revolutionary has won five out of twelve lifetime starts, most recently the G3 Pimlico Special Stakes on May 16th. Revolutionary’s workouts at four-furlongs have been clean and steady at Belmont Park and experts like the way the son of War Pass has looked in the last couple of months. I was on the Will Take Charge bandwagon long before his Travers Stakes win at Saratoga last year. I’m no expert, but I think he may be a bit burnt out. Hopefully D. Wayne Lukas will prove me wrong on Saturday but I’m not picking Will Take Charge at all for the 2014 Stephen Foster Handicap. Instead I’ll play Revolutionary, who in my opinion may be hotter than ever, alongside 10-1 Moonshine Mullin to make this week’s shoe shopping and champagne money! Why Moonshine Mullin? 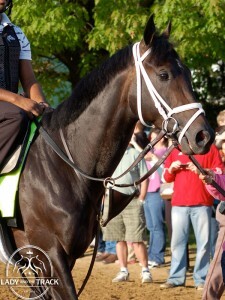 I like Calvin Borel at Churchill Downs and I always go for a horse on a winning streak. Moonshine Mullin is on a four-win winning streak, the last being the G1 Alysheba Stakes. The Stephen Foster Handicap is the 8th race of the day on a eleven-race card with a post time of 9:39 PM ET on Saturday, June 14, 2014 at Churchill Downs. 6 Departing 9-2 Albarado/Stall, Jr.